This collection of thirty-eight terrifying tales of serial killers at large, written by the great masters of the genre, plumbs the horrifying depths of a deranged mind and the forces of evil that compel a human being to murder, gruesomely and methodically, over and over again. From Hannibal Lecter... read more (The Silence of the Lambs) to Patrick Bateman (American Psycho), stories of serial killers and psychos loom large and menacing in our collective psyche. Tales of their grisly conquests have kept us cowering under the covers, but still turning the pages. 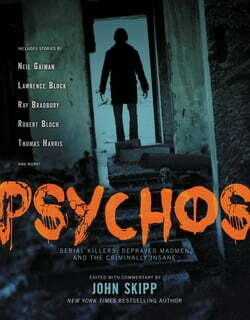 Psychos is the first book to collect in a single volume the scariest and most well-crafted fictional works about these deranged killers. Some of the stories are classics, the best that the genre has to offer, by renowned writers such as Neil Gaiman, Amelia Beamer, Robert Bloch, and Thomas Harris. Other selections are from the latest and most promising crop of new authors. John Skipp, who is also the editor of Zombies, Demons and Werewolves and Shapeshifters, provides fascinating insight, through two nonfiction essays, into our insatiable obsession with serial killers and how these madmen are portrayed in popular culture. Resources at the end of the book includes lists of the genre's best long-form fiction, movies, websites, and writers.